Appropriate in a way that I should finish my tour on the Expresso Breakfast Show three years to the day on which I started. 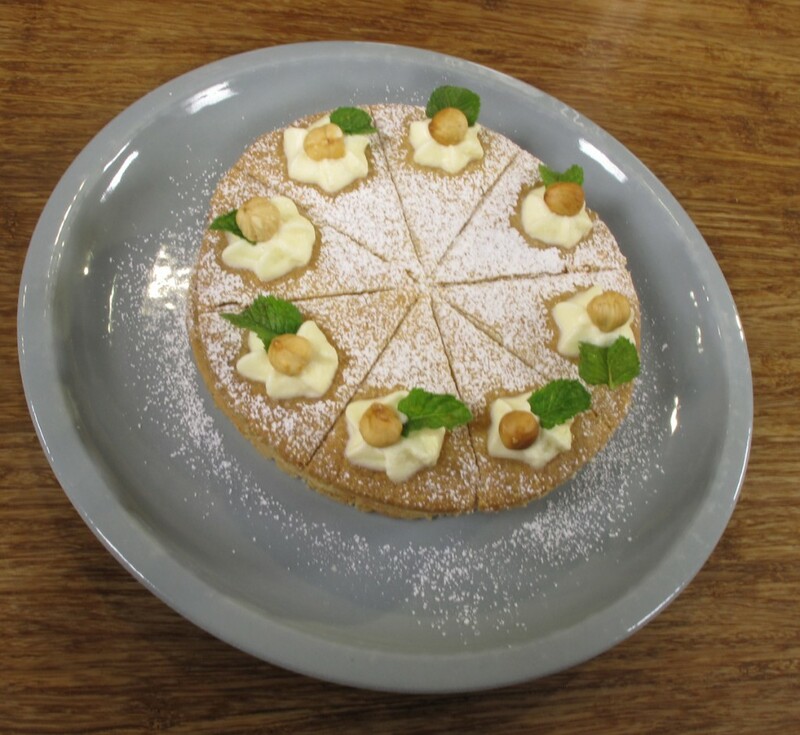 Appropriate too that it should be a dessert for the festive season. A nod to Rosemary Hume at the Cordon Bleu Cookery School in London who taught me to make this amazing Hazelnut pastry. If you would like to watch me make it – click here. 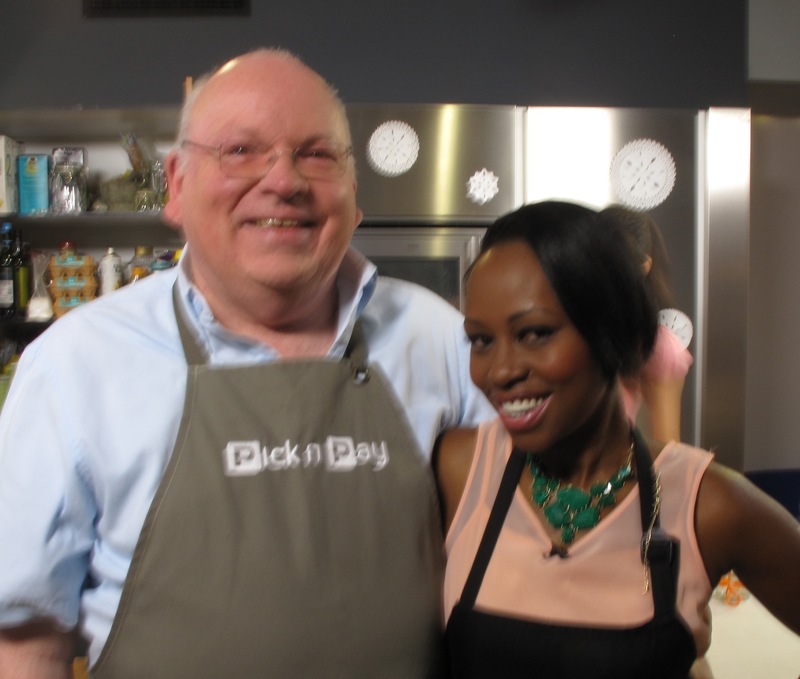 Elana Afrika-Bredenkamp is my fellow presenter – special lady and such fun to work with someone like her. For the filling. Peel core and slice the apple and place in a saucepan. Add the lemon rind and juice and sugar to taste and cook over low heat to break down the fruit. Beat with a wooden spoon and cook down to a puree. Add the fruit mincemeat and mix well. Allow to cool. For the pastry. Preset the oven at 180C. When the oven is ready toast the hazelnuts for ten to fifteen minutes until the skin is blistered are the nuts are a light gold in colour. Wrap them immediately in a tea towel, allow to stand for a while, and then rub off the skins. Save the best 8 for the garnish and grind the remainder in a food processor. Sift the flour with a pinch of fine sea salt onto a pastry board or counter top. Make a well in the middle and in it put the butter and castor sugar. Sprinkle the nuts over the flour. Using the tips of your fingers and lightness of handling quickly mix the ingredients no letting the mixture up beyond the first joint of your fingers. Once it has come together, scrape the pastry off your fingers with a palette knife and then smooth the pastry out with the heel of your hand. Place in clingfilm and refrigerate for at least 30 minutes. Weigh and cut into three equal portions. Roll out into thin circles; mark one of them into eight by cutting through to the baking tray. Bake in the preset oven till cooked and just turning gold around the edges. When cool, place the first layer of pastry on the serving dish. Carefully spread over half the apple and fruit mincemeat mixture almost to the edges. Repeat with the second layer. Carefully place the eight portions on top. Dredge heavily with icing sugar. Pipe a cream rose on the edge of each slice, garnish it with a hazelnut and a mint leaf.